CAIRO — Egyptian authorities have placed one of the country's all-time greatest soccer players on a terror watch and no-fly list, over accusations he helped finance the Muslim Brotherhood, now banned as a terrorist organization, judicial officials said Wednesday. Court officials said Wednesday that Mohamed Aboutrika, of Cairo's Al-Ahly club and the national team, was added last Thursday to a "terrorism list" that includes former president Mohamed Morsi as well as the Brotherhood's spiritual guide, Mohammed Badie and other leaders from the group. The Cairo Criminal Court ruling by judge Khalil Abdul Aziz included a travel ban and asset freeze for three years, although the decision could be appealed within 60 days, they said, speaking on condition of anonymity as they weren't authorized to brief reporters. 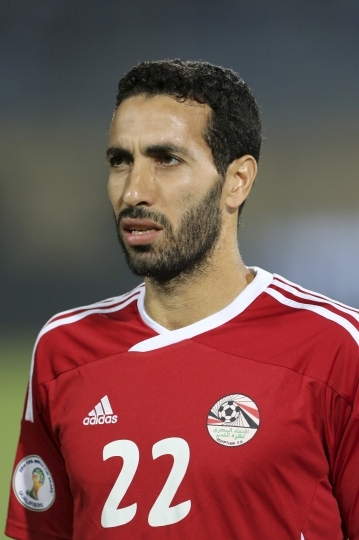 Aboutrika already had his assets frozen in 2015 based on suspicions of financing the Brotherhood — which emerged as the country's dominant political force after Egypt's 2011 Arab Spring uprising but was later purged when the army overthrew Morsi. He has denied ever funding the Islamists, who have been the main target of a fierce government crackdown on dissent led by President Abdel-Fattah el-Sissi, Morsi's defense minister who led the army's move against him. Hundreds have been killed by security forces and tens of thousands jailed, many under draconian anti-protest laws or new laws that broadly define terrorism. Earlier in the day, the government announced another step in that crackdown, saying they had arrested nine alleged Brotherhood leaders for planning to "disrupt order and security" on the upcoming Jan. 25 anniversary of the 2011 uprising. The Interior Ministry said the men had scheduled meetings a day earlier in Cairo and had plans "aimed at provoking public opinion by exploiting the economic situation the country is going through and coordinating with extremist entities." Egypt's flagging economy is a particularly sensitive topic this year, as it has undertaken drastic reforms to rein in unsustainable spending on subsidies and allow the currency to float freely, moves that have boosted prices radically. The poor, who make up nearly half the country, have been particularly squeezed. In a statement, it accused the group of planning to fabricate crises, in particular among "the masses and workers." Some of the men arrested had once been members of the Brotherhood's political party, and several had already been convicted in absentia for a variety of charges including incitement to violence. Meanwhile, Egypt's state prosecutor has referred over 300 alleged Islamists to military prosecutors over charges of terrorism and affiliation to a militant group which has been behind a string of attacks targeting police and military. In a Wednesday statement, the state prosecutor accused the suspects of links to the Hasm group, which is widely believed to be an armed offshoot of Egypt's now-banned Muslim Brotherhood. The suspects are accused of involvement in at least 14 terrorist attacks including a failed assassination attempt against the country's former grand mufti and targeted killings of top military officers. A total of 144 are in police custody while the rest are on the run. Among them is top Brotherhood politician Mohammed Ali Bishr, who has been in jail since Nov. 2014 — nearly two years before Hasm emerged.